MONTREAL (Reuters) - WestJet Airlines Chief Executive Ed Sims said on Monday he aims to reach a first agreement with unionized pilots this year, in a break with the Canadian carrier's former CEO, who said he did not expect a first contract before 2019. "We will reach a settlement this year," Sims told Reuters in an interview. "My focus is on a sustainable agreement for the long term." Sims, who joined WestJet last May, took over the carrier's reins on March 8, after then-Chief Executive Gregg Saretsky announced his retirement after nine years at the airline. Sims said the succession, while a surprise to markets, was well-planned. Analysts have raised concerns that Canada's second-largest carrier is taking on too many initiatives at once at a time of potential labor unrest with pilots. The Calgary-based carrier is negotiating a first collective agreement with the Air Line Pilots Association (ALPA), launching its new no-frills airline Swoop in June and expanding international flight offerings with upscale seating. 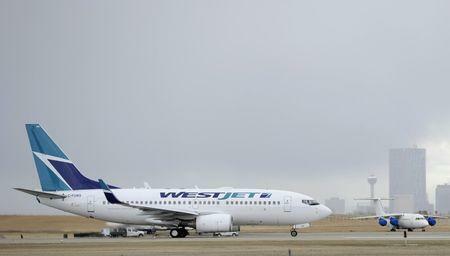 WestJet is facing no-frills start-ups as rivals to Swoop, which will operate as a separate ultra-low-cost carrier. Sims described Swoop as WestJet's biggest "weapon" against its main competitor, Air Canada , which recently announced a wide offering of base fares on its Rouge leisure service to appeal to budget travelers. Sims said WestJet has recruited Canadian pilots from outside the carrier to fly for Swoop after ALPA won an order at the Canada Industrial Relations Board preventing the airline from hiring its own mainline pilots at the budget carrier. Sims, however, said he believes WestJet pilots will one day be able to fly for Swoop. "At some stage, I firmly believe all of that flying will be operated by WestJet pilots," he said. ALPA has complained that domestic routes flown by its member pilots are being cut from the carrier's mainline and introduced at Swoop, which is not unionized. Sims said that while Swoop aims to be "supplementary and complimentary to WestJet," operations must be "be fiercely competitive in every regard." WestJet will also increasingly go head-to-head with Air Canada at the higher end, with an additional 70,000 premium seats expected in 2019. Expanding international service and adding premium economy and business seating will help boost revenue per available seat mile (RASM), a key metric used to measure airline efficiency. "As we drive toward a higher proportion of premium seats across our fleet, that's the bigger RASM opportunity," he said.